Peregrine falcons are the fastest animals in the world. They can dive at speeds well over 200 miles per hour! Also called the duck hawk, these widespread birds are found on every continent except for Antarctica. This peregrine falcon is swooping in to grab some prey in its outstretched talons! In the 1950s, 60s and 70s peregrine populations declined in many parts of the world due to pesticide use, particularly DDT. Many birds were killed due to a build up of the poison in the rodents they consumed, which had eaten poisoned insects. However, recovery efforts have helped the peregrine’s numbers become more stable in many areas of within its range. Like all Safari Ltd products, this figurine has been individually hand painted, features quality construction from phthalate and lead–free materials, and includes an educational hangtag in 5 languages. Realistic, educational, and fun, this figurine is suitable for a range of interests, including collectors, enthusiasts, teachers, and kids. Admire it on a shelf, use it in the classroom, or simply enjoy playing with it. 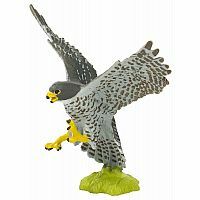 Our peregrine falcon figure features a wingspan of 3 ¾ inches and is 1 ¾ inches long and 2 ¾ inches high, making it just about the size of a standard sticky note. Its back is mostly dark grey, with lighter gray underneath and brown accents on its feathers. Its chin is white, its beak and feet are yellow, and its grassy base is a light green. FASTEST ANIMAL IN THE WORLD: Peregrine falcons are the fastest animals in the world. They can dive at speeds well over 200 miles per hour! Also called the duck hawk, these widespread birds are found on every continent except for Antarctica. This peregrine falcon is swooping in to grab some prey in its outstretched talons! COMING BACK STRONG: In the 1950s, 60s and 70s peregrine populations declined in many parts of the world due to pesticide use, particularly DDT. Many birds were killed due to a build up of the poison in the rodents they consumed, which had eaten poisoned insects. However, recovery efforts have helped the peregrine’s numbers become more stable in many areas of within its range. MADE WITH INDUSTRY–LEADING STANDARDS: Like all Safari Ltd products, this figurine has been individually hand painted, features quality construction from phthalate and lead–free materials, and includes an educational hangtag in 5 languages. REALISTIC APPEARANCE FOR MULTIPLE USES: Realistic, educational, and fun, this figurine is suitable for a range of interests, including collectors, enthusiasts, teachers, and kids. Admire it on a shelf, use it in the classroom, or simply enjoy playing with it. 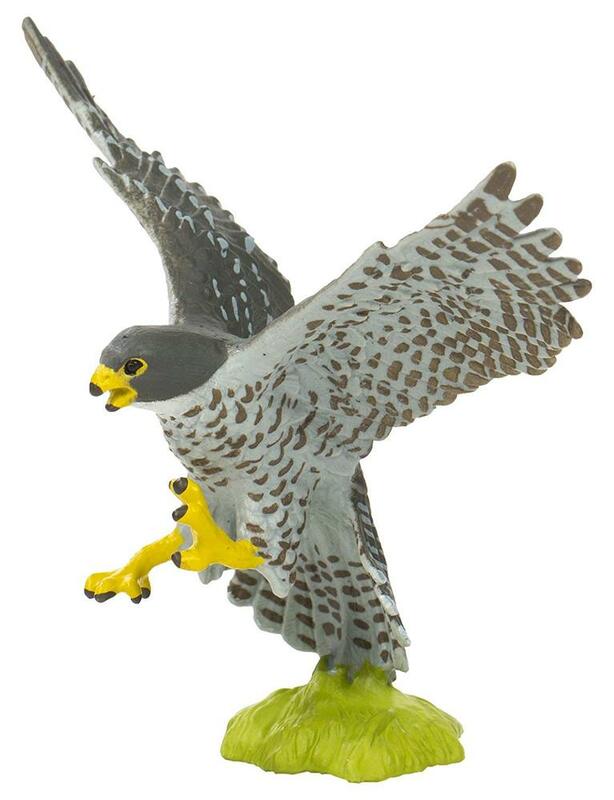 PRODUCT SPECIFICATIONS: Our peregrine falcon figure features a wingspan of 3 ¾ inches and is 1 ¾ inches long and 2 ¾ inches high, making it just about the size of a standard sticky note. Its back is mostly dark grey, with lighter gray underneath and brown accents on its feathers. Its chin is white, its beak and feet are yellow, and its grassy base is a light green.